Fans of the wines from Katnook Estate in Australia’s Coonawarra region may already be familiar with the name of Wayne Stehbens, who has been at the helm of winemaking duties since 1980, and is one of the most respected figures in the Australian wine industry. Earlier this year Wayne paid a trip to the UK to celebrate not only the release of a brand new tier of wines called Founder’s Block”, but his 25th anniversary at Katnook. Most intriguing of all, Wayne brought with him two wines from his very first vintage: the 1980 Katnook Estate Sauvignon Blanc and the 1980 Katnook Estate Cabernet Sauvignon. Like most great things, Katnook estate was founded by a Scot: John Riddoch established the vineyards back in 1890, then known as the Coonawarra Fruit Colony. Riddoch planted 140 acres of vines, and his first vintages from 1895 onward were modest affairs, the wines being made in a woolshed on the property. But this was the birth of Katnook. Wayne Stehbens himself has early memories of helping in his father’s vineyards, where in the mid 60’s they cleared a patch of land for planting. In his quarter century at Katnook he has garnered a clutch of awards, including two ‘Jimmy Watson’ Trophies, the highest accolade down under. This tasting, which also included Katnook’s top red wines, Odyssey and Prodigy, was organised by Katnook’s UK Agents, Bibendumns Wines. Approximate retail prices are given. This has a fresh cut grass and gently floral nose with pleasantly vegetal notes of pea pods, lemony fruit and a juicy, passionfruit elegance. It is really fresh on the palate with masses of crunch, a nice, rounded mouthfeel and a crisp, juicy finish. Lovely style and very good indeed. Around £7.99. The nose is suffused with creamy almond notes, with green apple and melon fruit that is nicely weighted. On the palate it is clean and crisp but with a hint of succulence, as a pineapple sweetness lies just beneath a layer of crunchy, lemony acidity giving verve and bite. Very good indeed. Around £7.99. As was confirmed by the terrific 1980 Sauvignon Blanc, 1980 was an excellent vintage in Coonawarra – along with 1981 the best of the 1970s and 1980s according to Wayne. This has a distinct brown rim, and a meaty depth about the nose. Ox-tail notes, with a very sweet, slightly raisined fruit quality, with eucalyptus notes to berry fruit. On the palate it is still harmonious and sweet-edged, with a bloody note of dry fruit and low tannins. There’s enough acidity there, and a balance of fruit, to finish very nicely. Very good indeed, though maybe just past its best. Not available. Blackcurrant pastille fruit and a darkening touch of damson and black cherry on the nose, with a subtle background of smoky oak. The palate has vivid, ripe blackcurrant fruit with supple tannins and lots of tart, savoury acidity. Very good indeed.Around £8.59. A very expressive black pepper nose, with spices, a hint of grilled meats, and a nice sweetness of black fruit. On the palate quite a silky texture to this wine, with a smooth, medium body but a chewy density of fruit. Dense and savoury, the grilled meat notes continue with a lovely dark berry fruit and acidity. Very good indeed/excellent. Around £8.59. From magnum. Odyssey and Prodigy (below) are the twin flagship reds of the Katnook portfolio: super-premium wines that are not released each year and which are given massive attention in the vineyard with canopy management and shoot removal to restrict yields to tiny amounts. The wine spends 40 months in mostly new French oak barrels. Very dark, dense colour. Fine charcoal and dried blood nuances on the nose, with fantastically rich, enveloping fruit. On the palate that svelte, plush weight of fruit powers through, with notes of mocha coffee and mint, and a nice savoury freshness on the finish. There’s a certain schisty, mineral quality that gives this a little edge, into a good, long finish. Very good indeed/excellent. Around £33.00 per bottle. 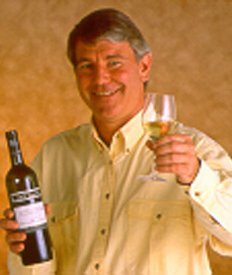 This wine won Wayne his second Jimmy Watson Trophy. It has a huge aroma of almost stewed black fruits, almost veering into volatility, but rescued by the sheer depth of glossy black fruit, mint and chocolate. It is full and fantastically sweet and spicy on the palate, with lots of star anise spice, liquorice and very, very fine black fruit. The whole picture has a dry, chocolaty tannic layering and a nicely savoury acidity. Very good indeed/excellent.Around £33.00 per bottle.